This is to serve as reminder to all the candidates that are still interested in the Osun State University (UNIOSUN) 2013/2014 academic session pre-degree programmes that the the application will be closing soon. 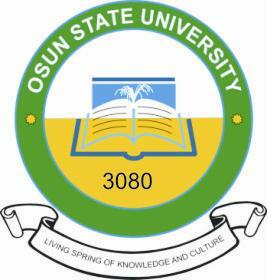 Check: UNIOSUN 2013/2014 Pre-Degree Registration Details and Requirements. Submission of UNIOSUN pre-degree programme forms will end on 1st of November, 2013. Interested candidates can still carry on with their registration process.